"Ghetto Defendant" by Allen Ginsberg & The Clash, on vinyl. "Big Sky Alberta" by Sheri-D Wilson. "Berlin Suite" by reg e. gaines. "The Healing Poem" by Michael Lally. & "The Cheese Shop" by Monty Python. "149th & 3rd" by reg e. gaines. "The Phone-in" by Monty Python. So Many Film Projects . . .
radio handwritten letter . . .
Full moon Tuesday, the Vagabond Trust howled on Ashes, Paper & Beans! Show started with "Poetry And All That Jazz" by Jack Kerouac & United Future Organization. I was joined live on air by Vagabond Trust writers' group members Katie Brown, Ryan Griffith, Corenski Nowlan and Jordan Trethewey for a lively roundtable interview and reading of poetry and fiction by the members present. Show ended with "Winter" by Kevin Matthews. 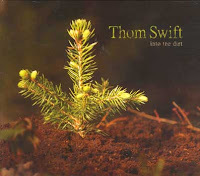 Tonight's SOCAN-monitored Ashes, Paper & Beans featured an interview by Joe Blades with performing songwriter Thom Swift that was recorded during Harvest Jazz & Blues Festival 2007. It was followed by a partial recording of a Fredericton reading by Alberta poet Yvonne Trainer, and the show ended with "Airplane Paula" by Sheri-D Wilson w/ Russell Broom. 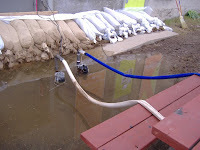 1:11 pm, Wednesday, 30 April: Supply & Services had two small electric pumps working in the storm sewer depression below York Parking Lot level in front of their yard machinery doors and the entrance to Gallery ConneXion. End of the previous week, I'd helped raise and pack stuff in the gallery while hoping that it didn't flood. 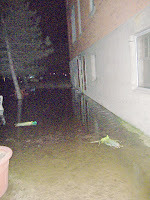 11:55 pm, Wednesday, 30 April: Saint John River flood waters near midnight, against the back of the Justice Building Annex, at the top of the sandbag wall. Clearly not build high enough, but nothing more to be done. I was surprised at how fast the river rose during the afternoon, trapping some cars in the armouries end of the parking lot. S&S workers were in the higher parking lot beside the open boiler room doors with pumps aworking there. I caught an Acadian bus to Nova Scotia on Thursday morning heading to my remaining grandmother's 89th birthday and a feed of Eastern Shore lobsters. The galley, adjacent artist studios, and some of the Justice Building was flooded with about two and a half to three feet of water. 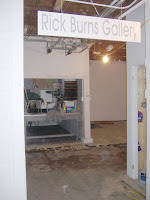 On Wednesday, 7 May, I got a phone message from Meredith saying the gallery was lost and everything good or salvageable had to be moved out by the end of Thursday. After working an Art Bank emergency I went over. Supply & Services and contractors they brought in had already started cutting out the floor to get at the water and to prevent the buildup of mould. 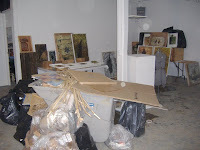 Artists Lucy Robichaud and Carol Collicutt lost plenty of stuff in their studios: soaked supplies and artworks. This is some of the pile of now garbage pulled from their studios. They were in shock, grieving, when I was there packing and hauling ConneXion stuff for 10 intense hours on Thursday. I was driven to get the good furniture and books, and archives and admim materials out of the gallery. For Friday, the Art Bank booked a truck, and called me in to work to collect art (only dry, not damaged work) from ConneXion and its artists and to take it to the NB Art Bank's storage space in the Heritage Collection Centre at King's Landing. Even with my assistant, Heather Wilkinson, it took us all day to load, pack, tranport and unload the work: over a hundred pieces of art. ConneXion and its artists had been there 24 years [and I've been active at ConneXion since the summer of 1988]. Lots of history in this place, Fredericton's only artist-run centre. Rick Burns was one of the founders. The main gallery in ConneXion was named in his memory last year. 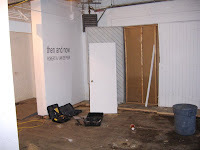 Now it's gone, gutted to the cement floor and brick walls that ConneXion members worked so many years to renovate and cover with sturdy Sheetrock-covered plywood for a better exhibition space. 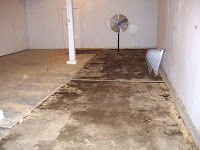 It will likely cost tens or hundreds of thousands of dollars for the cleanup and rebuilding of this whole basement space, to bring it up to building code, with no certainty that it won't get flooded again next year or five years from now. Worse, there's no guarantee that Supply and Services will let ConneXion back in the government building. ConneXion is its artists and what happens at the gallery. Now, ConneXion needs a home—temporary or new remains to be seen—to continue its almost 25 years of artist activities in downtown Fredericton. A new space will almost certainly cost more to rent, and it would need renovations to make it work as an exhibition, presentation, performance and workshop space. And that doesn't address the need for artist studios . . . The currently scheduled exhibition then and now by Robert A. van de Peer, Master Printmaker was crated up and removed before the flood. It opened, had an artist talk and a workshop but its run has been cut short. The summer artist residency, "Familiar Territory" by Lois Schklar, is now up in the air. ConneXion needs space, a home. 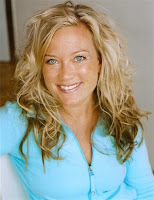 Thanks to Jim Lavoie contacting me yesterday morning, last night's Ashes, Paper & Beans changed from a program of recordings to mainly being a live interview episode with Fredericton native, actor Lita Llewellyn. For a laugh, the show started with Monty Python's skit "Wide World of Novel Writing". Recently a lead in one of the three stories in the Diplomatic Relations film shot here in Fredericton, Lita Llewellyn was also a principal in the just released Snow Angels Canadian feature [not yet on screens in New Brunswick . . . petition Empire Theatres to bring it here] directed by David Gordon Green and staring Sam Rockwell, Kate Beckinsale, Nicky Katt and Michael Angarano. See the recent issue of the New York movie magazine Big and and a forthcoming issue of [here]. 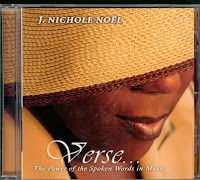 I then played a feature of six pieces by J. Nichole Noël off her 2005 CD Verse . . . The Power of the Spoken Words in Music: "The Gift", "The Essence of Sweet Music", "Adultery of the Mind", "Parent and Child—A Love Unlike Any Other", "Let Not Our Voices Go Unheard", and "Silent is the Bird Without a Song".